Contentious medical cannabis compromise bill passed by state House and Senate lawmakers. About an hour into a legislative discussion on medical cannabis, Rep. Brian King said he wanted to address the elephant in the room: that The Church of Jesus Christ of Latter-day Saints had influenced the “compromise” agreed upon a month before voters passed Proposition 2—a ballot initiative that legalized medical cannabis in Utah. 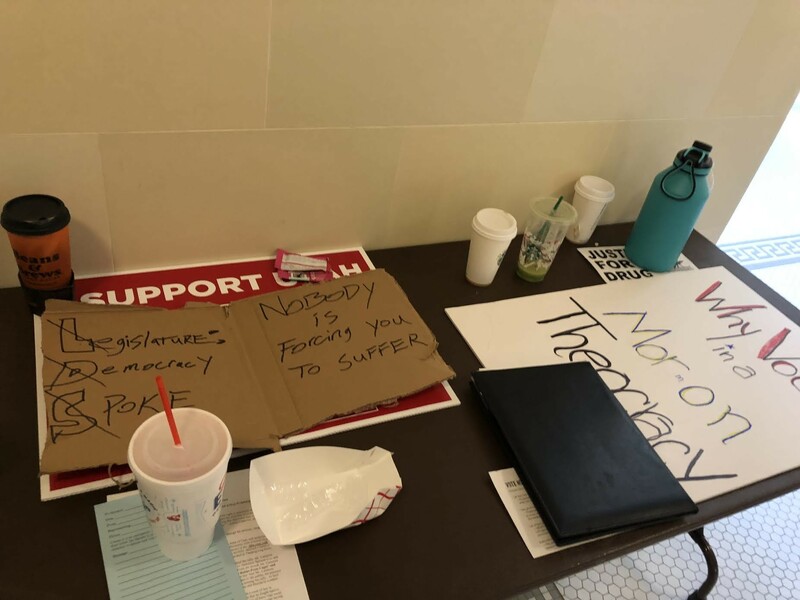 Some citizen-made signs not allowed into the Legislature on Monday. King wound up being one of 13 state representatives who voted against the compromise. Sixty of his peers voted in favor, easily passing the bill to the Senate, which would pass it 22-4. Gov. Gary Herbert is expected to sign it into law. The compromise differs from the ballot initiative in several key ways. Unlike Prop 2, medical cannabis users would not be able to grow their own cannabis plants if they don’t live within 100 miles of a dispensary. Also at odds is where patients would pick up their cannabis. Under Prop 2, they’d go to a privately owned dispensary; were the compromise to become law, they would go to a local health department that received the medicine from a state-run central fill pharmacy, or to one of seven—or 10, if the state doesn’t set up its central fill within a few years—privately run pharmacies. Critics of the compromise say that could limit patients’ access. Amid all the Republican back-patting for reaching a compromise, some legislators acknowledged that a few things—like added protections for government employees and more oversight of who would be on the Compassionate Use Board—will need to be modified in the upcoming legislative session. Democrats questioned the need to pass the compromise less than a month after the election, given that the general session is a mere month and a half away. “It’s irresponsible. We’re rushing this. It’s bad public policy, and it’s sad,” Sen. Luz Escamilla, D-Salt Lake City, said.